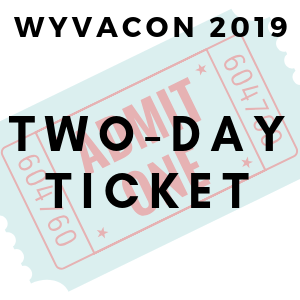 WyvaCon 2019 Two-Day Ticket – WyvaCon | WyvaCon, INC. Experience a weekend of WyvaCon by securing your ticket online…at a discount! We only accept PayPal for online ticket sales. No checks will be accepted. Please be sure to print this page for your records. Please provide the following information for each ticket at the Checkout page. If you require more room please use the Additional Information / Comments field found at the bottom of the Checkout page. Tickets will not be mailed. Bring your receipt (printed receipt page or receipt email) to registration along with a government issued photo ID. WyvaCon tickets are non-refundable, non transferable, and cannot be transferred forward to the following year. See the WyvaCon Policies page for additional information. Enjoy both days of WyvaCon 2019 for a discounted rate of $15 (tickets at the door will be $20). Be sure to present your receipt at the registration desk upon arriving at the event.